Mother, fighter, small town girl, patriot, reformer, energy expert, hockey mom, McCain attack dog, America's political sweetheart  she did everything she had to do, and more. The Alaska Governor was poised, stirring, charming, confident, snarky, cozy, well-rehearsed, biting, utterly fearless, unflappable, and self-assured. 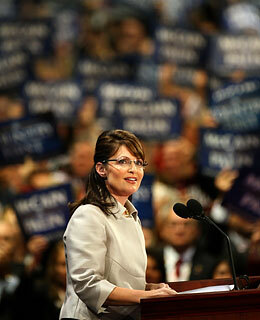 She read the teleprompter like a champ, with fine, varied pacing and conversational projection. Touched on her family story and then veered into a forceful political presentation, going hard after Barack Obama and selling John McCain with flowing admiration. She rocked the hall (and likely the country) with a tough, conservative message, steely offense, glowing optimism, and boundless charisma. The start of something truly big  or the best night of her candidacy.